The large diameter SS nut is not available at home centers. I came in a few days. Thank you. I'd like you to set 4 or 6 or 8 instead of just 3 pieces. I reduced my feelings. This review is about item#5528941. The finish was good too and I was very happy to work smoothly. This review is about item#5528853. When manufacturing the robi, I fix it with M2 bis at the connection of the neck and the body, but because the body is plastic, there is concern that it is only a screw, and it was used as a reinforcement of the bis and the body connection. It is possible to fix firmly and relieve. This review is about item#23442938. It was solid and could be used without any problems. There was no such thing as Bali. This review is about item#5528905. Useful for tightening the double nut. The thickness is thin, the price is reasonable. 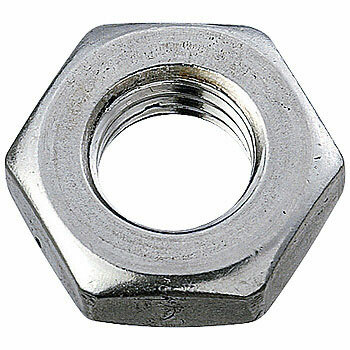 Purchase to tighten with double nut. This review is about item#5528887. It is handy because you can tighten the screw in a place where the hand does not enter the machine. This review is about item#5528871. It is a repeater. I used this item because the cheap stainless steel screw shop went bankrupt so far, but I am very satisfied with the quality and price as well. Thanks to this I was able to do the repair that I imagined. It is perfect without the trouble of the nut itself. It is quite expensive, but I think that it is a good commodity though it does not become quite easy in DIY because there are many quantities. The monotaro with three stain nuts is easy to get! I was looking for a thin thing, so it was just good quality for lock adjustment loosening prevention.